After the Frieze Art Fair's first appearance in New York City, it has announced the full list of exhibitors that will be attending the fair in London this October. 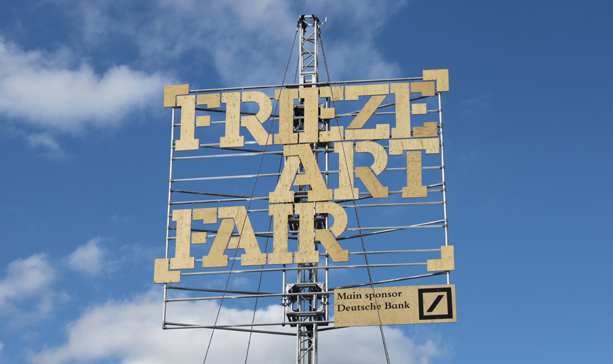 Frieze Art Fair will take over Regents Park from the 11th to 14th October, and this 10th edition of the show looks to be very promising. As well as having 170 exhibitors on the books, the fair will also have a Focus section, which will be entirely dedicated to galleries that were established after 2001. This aspect of the fair was introduced as part of Frieze New York, and as a mark of its success, will be a feature here in London later this year. The fair will also include a Frame section, which is devoted to galleries that are less than six years old, which are delivering a presentation of a single artist for the fair. London is set to see 21 galleries in the Frame section, 16 of which will be first-timers. At the opposite end of the spectrum, there will be Frieze Masters. This brand new fair, linked to the main outing, that will debut with 99 galleries, and will present pre-21st century art.